Being in the middle of my tenure track, I cannot skip running into different ways that people use to evaluate research. One of the most common ways to evaluate papers (at least at a very high level) is to look at the impact factor of the journal, and classify the paper as "published in a top journal," "published in an OK journal," or "published in a B-class journal". I have argued in the past that this is a problematic practice, and an article published in Nature provides the evidence. To summarize the reasoning: articles published within the same journal have widely different citation numbers, therefore using the average is simply misleading. If you evaluate a paper using the impact factor of the journal, the evaluation is almost always a significant overestimate or a significant underestimate of the paper's "impact". (Assuming that citations measure "impact".) Read the analysis below for an illustrating example. The impact factor itself is a very brittle metric, as it is heavily influenced by a few outliers. If indeed the in-journal citation distribution is a power-law, then the impact factor itself is a useless metric. Now, let's split down these numbers by publication. 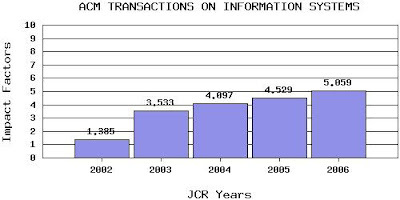 By looking at the number of citations per publication, we can see that there is a single paper "Evaluating collaborative filtering recommender systems" by Herlocker, which has almost 30 citations in 2006. Taking this single publication out, the impact factor is reduced to 4.3. In fact, if we take out of the calculations the papers published in the Special Issue for Recommender Systems (Jan 2004), then the impact factor drops even more, and comes close to 2.5. At the same time, the impact factor of the papers published in the special issue is much higher, getting closer to 15.0 or so. Given the unusual high impact of that special issue, we can expect for the 2007 impact factor for TOIS to decrease substantially. It would not be surprising to see the impact factor for 2007 to be in the pre-2003 levels. Therefore, a set of other metrics may be preferable. The obvious choices is to use the median instead of the average, and report the Gini coefficient for the papers published in the journal. The Gini coefficient will show how representative is the impact factor. Next step is to examine the distribution of the number of citations within the journals. Is it a power-law, or an exponential? (I was not able to locate an appropriate reference.) Having these answers can lead to better analysis and easier comparisons. This year SIGMOD and KDD started playing with the idea of experimental repeatability. The basic idea is to generate guidelines and processes that will encourage repeatability of the experiments presented in many papers. The reasons are rather obvious: We need to be able to reproduce the experiment, to avoid any hidden bias, catch errors, and even avoid outright fraud. Furthermore, this encourages publications of techniques that are easy to implement and test. Why do we care? If the method is impossible to implement then it is an obstacle to research progress. A published paper that claims to be the state of the art, but is not reproducible may prevent other reproducible methods from being published, just for lack of comparison with the current state of the art. Now, it is easy to talk about open source, but anyone who tries knows what a pain it is to take the scripts used to run experiments and make them ready to use by anyone else. (Or even to be reused later, from the author :-) Therefore, we need to give further incentives. The idea of the JMLR journal to have a track for submissions of open source software; this track serves as "a venue for collection and dissemination of open source software"
Perhaps this is the way to proceed, an alternative to the "experimental repeatability requirements" that may be too difficult to follow.